The latest reincarnation of King Kong, Kong: Skull Island, hit theaters on Friday with a familiar storyline: A gigantic ape wreaks havoc, humans try to take the monster down, and when they succeed, the world is restored back to order. But could an extraordinarily huge ape ever truly exist? One hundred thousand years ago, one did, says Herve Bocherens, a paleobiologist teaching at Universität Tübingen in Germany. Bocherens is an expert in the beast closest to being the real-life version of King Kong, a three-meter (9.84 feet) tall ape appropriately dubbed Gigantopithecus blacki. We know frustratingly little about Gigantopithecus, however: The only fossils that have ever been found are those of a fragmented lower jaw with “reduced front teeth and enlarged molars and pre-molars,” according to a December 2015 paper published in the journal Quarternary International. The southeast Asian orangutan ancestor was huge — more than twice the size of an NFL defensive lineman, both in height and weight. It ate plants. It was powerful. And that’s about all we know about Gigantopithecus. Was it a bipedal or a quadripedal? Was it robust like modern day gorillas, with a wide chest and beefy upper body supported by thick, muscular legs? Or was it wiry and slender, more akin to a lanky man? Was it violent, combative, thrashing? Or was it a gentle giant, ambling about like a panda, unsure of how to live within its expansive presence? For his part, Bocherens harbors a guess that its sheer size and weight make it more likely it walked on all fours, but he can’t discount bipedalism, especially given how easily primates transition between walking and crawling. “We don’t know,” Bocherens shrugs. But what we do know is that there is no way King Kong could exist in real life. For that, we have Gigantopithecus’s jaw remnants to thank — and the rigid rules of biophysics. Bocherens breaks it down, working with the assumption that the giant ape that terrorizes Tom Hiddleston and company in Skull Island hovers around 30 meters (about 98.5 feet) high. “That’s totally unrealistic!” Bocherens scoffs, with a chuckle. With every meter in height, Bocherens says, we should expect about eight times the volume. Doubling from one meter to two meters, in other words, doesn’t mean a doubling in the volume — it means the two-meter individual is eight times the volume of the one-meter individual. That’s because volume not only takes height into account, but width and surface area. In the case of Gigantopithecus versus Kong, we’re talking about a comparison from an animal that’s already coming in at three meters high and around 270 kilograms (a whopping 595 pounds) to a seemingly insurmountable 30 meters tall and 4,050 kilograms heavy (8,928 pounds, or about 4.5 tons). That’s quite the monster, but Bocherens says that when you consider the fact that Kong is stuck on an island for the extent of his existence — whether that be Manhattan or a non-existent South Pacific island, Kong’s volume-size ratio makes it impossible for him to exist. “There are limited resources on an island,” Bocherens explains. Not only would Kong wipe out all the vegetation needed for his diet pretty quickly, but also there’s no way he could even exist as a giant ape. In fact, island-bound animals tend to evolve as smaller versions of their landlocked counterparts: they’re shrunken, more efficient, and require less mobility and food to fuel their existence. Which brings up the fact that Kong’s existence as a giant ape is further complicated by his seemingly plant based diet. 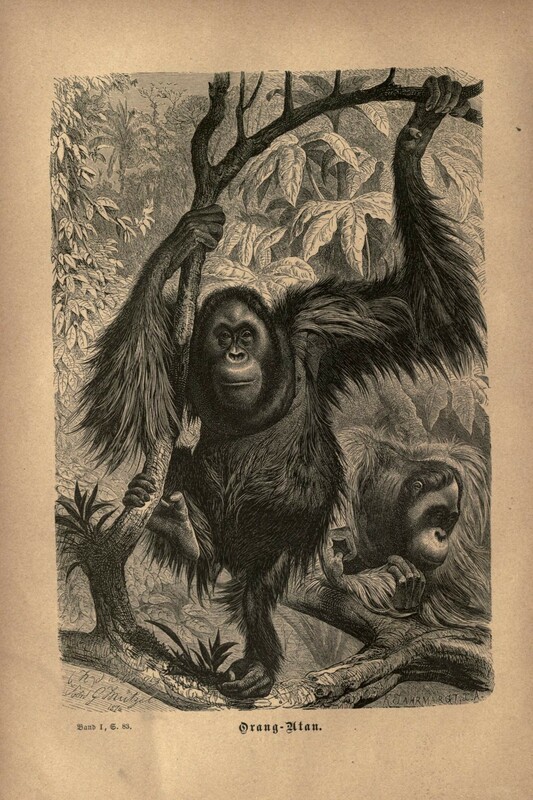 Gigantopithecus’s jaw indicates that he wasn’t munching on flesh, which lines up with what we know about modern day primates — our largest ape today, the mountain gorilla, is an herbivore, and the primate most like humans, chimpanzees, might go wild with the occasional insect or go on a hunting trip but rarely consumes meat. “If you are big, you need to eat a lot,” Bocherens points out, which makes a plant-based diet the most efficient for big animals. It’s inefficient — the volume of food required to make the smallest dent in protein intake is daunting — making Kong’s size that much more unrealistic. Gigantopithecus’s likely demise was, perhaps ironically, at least partially a result of climate change — the plants it relied on to fuel its everyday existence ceased to exist, Bocherens says, pointing to a drier, hotter environment that reduced the lush vegetation Gigantopithecus had relied on. The other reason why Gigantopithecus disappeared off the face of the Earth: humans. One hundred thousand years ago, humans from neighboring islands were probably exploring, came across the gorilla, and either hunted it into oblivion or ensured its starvation. It’s a story that oddly lives out today, acting as a warning signal for the power of humanity to permanently destroy what is natural and create fear where there may be none.